Google Earth's satellite images of the crust of our planet are a marvel of modern technology. I am forever amazed at how detailed they have become, and that makes me wonder what even more precise detail our country's spy satellites can achieve. Despite the many uses for Google satellite images in our daily lives, one weakness in their system was the often stale nature of the images. We the viewer were always at the mercy of Google's satellite orbital schedule, and since this planet is a fairly large target, sometimes an image stays on their system for a very long time. 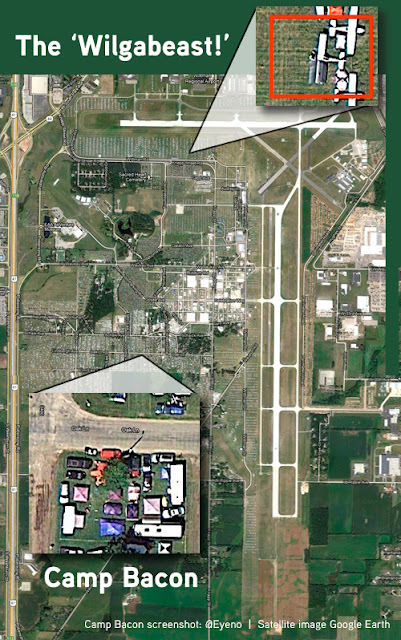 So it is very good news that somehow, the current Google Earth satellite image of Wittman Regional Airport (KOSH) was taken on opening day of AirVenture Oshkosh last summer on July 25 according to EAA. From space, Cory's 1984 PZL 104 Wilga 35A looks much like any other high wing airplane parked in the endless rows of parking that parallel's KOSH's runway 9/27. But the way Cory brought us all along for the ride as he journeyed to and from Wisconsin is notable. 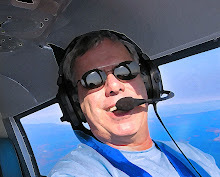 He tweeted and posted on Facebook about going “Low and Slow to Oshkosh” and it was a really interesting look at a very interesting flying machine. Once there, Robin personally impressed me when he donated two dozen posters of Amanda Franklin to my magazine's Tweeplechase event. He had purchased the posters as a fund raiser for the Franklin Flying Circus, and by donating them to Airplanista Magazine, he leveraged that purchase to do as much good as possible. BTW, the “Wilgabeast” as it is affectionately called, has undergone a complete off-season engine replacement, adding another 100hp, and will have a new paint scheme and super groovy new nose art designed by a Brussels artist when we see it again this summer at Oshkosh 2012. When you look at the screen grab posted in Twitter by @Eyeno of Camp Bacon, you see all that makes a trip to Oshkosh so special. The red vehicle at the top of the inset above is the Chevrolet HHR owned by Martt Klupper, a.k.a @AirPigz, and the large RV to the bottom of the inset is Mike Miley's @HomeSweetRoad, a.k.a. the mobile home of the MyTransponder digital universe during AirVenture. The RV to the right was the OSH temporary home of @Adamcanfly and @PilotStu. This collection of tents, beer, bacon, camaraderie and aviators demonstrates the social nature of this event. Throughout the show, people come and go at Camp Bacon, telling stories and enjoying the company of many like minds. Camp Baconites lean heavily on the geek end of the aviator spectrum, all are on Twitter all day every day, and the camp is ground zero for meet-ups between new friends and those who are eating the bacon (drinking the Kool-aid?) for the first time. Oh, and all that bacon? It's a Martt thing, 'nuf said. While the two tiny insets I have added above give you a glimpse into just two stories that were running concurrently at #OSH11, the enormity of the entire show grounds multiplies those stories many thousands of times. If you have been lucky enough to get to the “World's Largest Aviation Celebration” and have walked all day every day, now that you see the show as a whole, you know why your feet and legs ached when you finally stopped for the night. Every speck of this satellite image has a back story, a tale of aviators who waited all year to load up the Cessna and plow across the square states towards the biggest hangar party ever created. If you have never been to AirVenture, go here and zoom around a bit, and try to imagine being down there on the ground, immersed in all that aviation goodness. Many of you will be already planning your #OSH12 trip, but I do not think I will be in your camp this summer. I have a massive European trip planned about the same time, and taking time off work for both Oshkosh AND Vienna will be impossible. So I think I'll be skipping this year's version of the Oshbash, which is a bummer but it'll give me many more months to prep for a grand re-appearance at #OSH13.